I tried to pay attention to the music at the General Convention of the Episcopal Church this year, which took place in Austin. The worship planners did a good job of blending the old and the new, and of the new I noticed–by reading through the bulletins, which are available online– that the name Scott Chard came up several times. Much of the music was written by him and he was the artistic director for worship. A quick Google search reveals that Chard is the Praise Chorus Leader at St. Augustine of Canterbury Episcopal Church, Oklahoma City. There is surprisingly little else to be found about Chard on the internet, except that he has one studio-length album that you can purchase online or stream for free on YouTube. 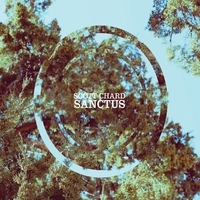 The album, which was released in 2013, is called Sanctus and includes re-tuned hymns as well as fully original songs by Chard himself. We haven’t talked about re-tuned hymns yet among these blog posts. In the church music world, a hymn is called “re-tuned” if it is an old text with a new, contemporary-style musical setting. Everyone knows the tune to “Amazing Grace,” for instance, but Chard has written a completely new tune to go with this text. Many listeners find it jarring at first to hear such a familiar text set to a new tune. The idea behind any new tune, though, is for the timeless words to hit the listener’s ear in a fresh way. Re-tuned hymns always use a modern, popular style of music, so as to appeal to listeners whose tastes tend more toward rock-n-roll than classic hymnody. Chard’s re-tuning of Amazing Grace is reminiscent of the 90’s band Guster, with its light percussion, acoustic instruments, and relaxed pace. “Crown Him with Many Crowns” has acoustic guitar played with a Spanish flair, backed by Guster-like percussion. “God Himself is There” reminded me of Sixpence None the Richer, also a 90’s band. “Deliver My Soul” is my favorite track. It has a driving beat and highlights Chard’s gentle southern accent. The whole album is very gentle. I would even call it chill. CD Baby, Chard’s label, says you will like Chard’s music if you like James Taylor and I would agree with that. Now that I’ve heard the album a few times I would say it stands out mostly for its inoffensiveness. Like Guster or James Taylor, Chard is very relaxed. Relaxed is good. I enjoyed listening to the album and found myself humming the tunes throughout the day. Nothing really stood out to me, though. I was hoping to find something new and irresistible. I was hoping to be inspired, or at the very least, I thought I’d find something catchy. I didn’t find it on Sanctus.